Making cake is as rewarding as sharing it. The calming hum of the mixer soothes as you watch all the ingredients fold into a beautiful batter, inhaling with every turn of the beater. This cake honours the traditional hot cross bun, with all its fragrant spices and a hint of citrus. 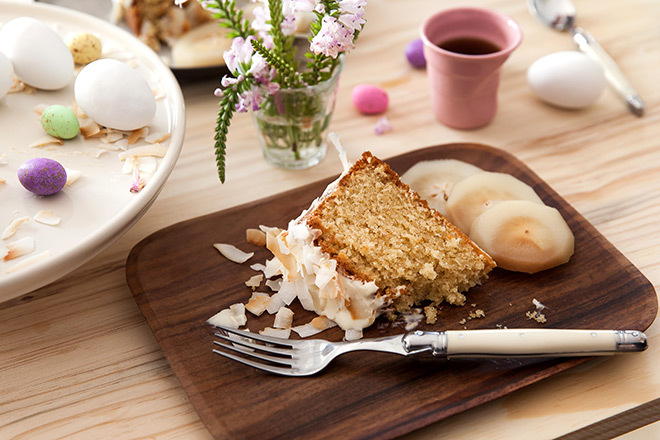 It’s baked until the whole kitchen bursts with the aromas of Easter and the pending egg hunt. 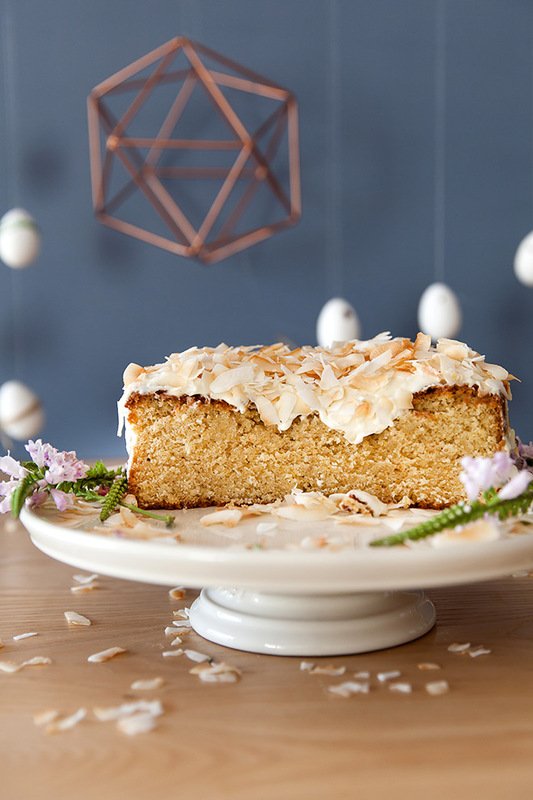 Give it a cloak of cream cheese frosting and top with toasted coconut for a subtle crunch and a little wow factor. 2. Beat the eggs in a large bowl with the buttermilk and vanilla extract. 3. In a separate bowl, mix together the flour, sugar, ground almonds and baking powder. Then add in the coconut, zest and spices. Melt the butter and allow to cool slightly. 4. Add the eggs to the dry mixture and mix, then add the melted butter. 5. Bake in a deep 20cm deep springform cake tin, for 1 hour and 15 minutes. Remove from the oven when the cake bounces back to the touch, and allow to cool on a wire rack. If the cake starts to get too brown but is not cooked, keep it in the oven and cover loosely with tinfoil. 6. Place the coconut flakes on a baking sheet and toast in the hot oven for 5–10 minutes to tinge the edges with a little golden brown. 7. For the icing, mix together cream cheese, icing sugar, vanilla and lemon. Beat to a smooth icing. 8. Next make the marzipan for the top of the bun. 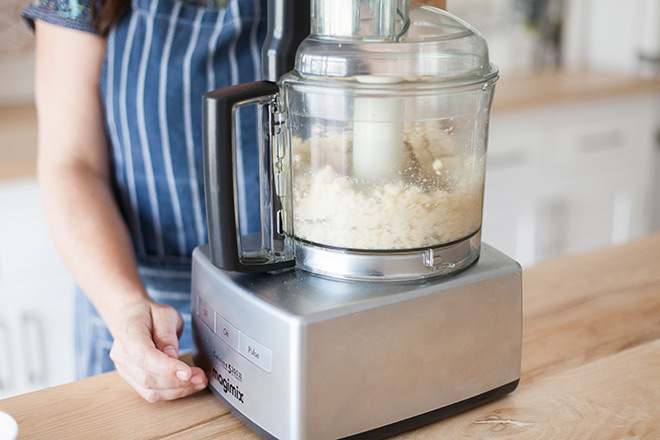 Blitz the almonds to a fine powder in a food processor with the castor sugar. Remove and place in a small bowl. Add the egg white and cinnamon and blend to form a paste. 9. Ice the cake with the cream cheese icing and set aside. 10. To make the marzipan cross (which is entirely optional) roll out the marzipan using icing sugar to prevent sticking. Cut two thin ribbons in approximately the same diameter as your cake (20 cm) for the two lengths of the cross. Bake the two lengths of the cross for a few minutes in the oven. Remove and allow to cool completely, then place on top of the cake and decorate with your toasted coconut flakes. Keep in the fridge and remove at least half an hour before serving. 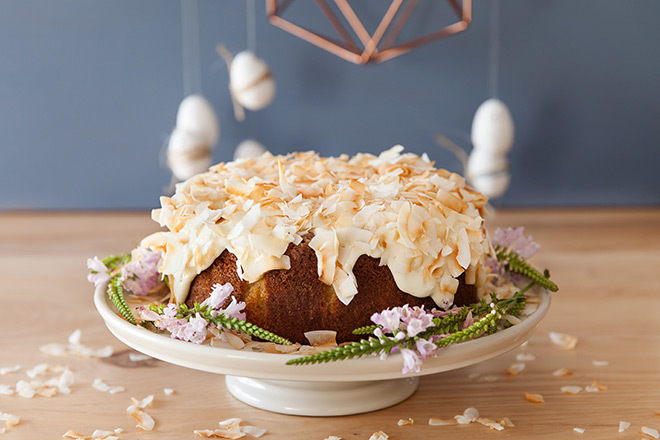 This is the hot cross bun going gourmet – we hope you decide to take on the adventure of baking this cake this Easter.